I am ecstatic to tell you that I had another good run this morning and I have to give some credit where credit is due. For starters, I have to thank the wonderful people who created and produced Body Glide. I was getting tired of the sports bra and waist band rash that has been a constant pain in my body. I was told a hundred years ago that Vaseline was the same as Body Glide and that I should just use that cause it was cheaper. After weeks of that not working and the coincidence that I just happened to be near a sporting goods store I bought some yesterday. This morning I had to get up about 45 minutes earlier so that I could slather my body in Body Glide, Ok maybe just 2 minutes earlier but I would have spent 45 minutes if I had known it was going to be as great as it was! Not a bit of discomfort today during my run...not one single bit. Then as I mentioned last night I had new socks today too. 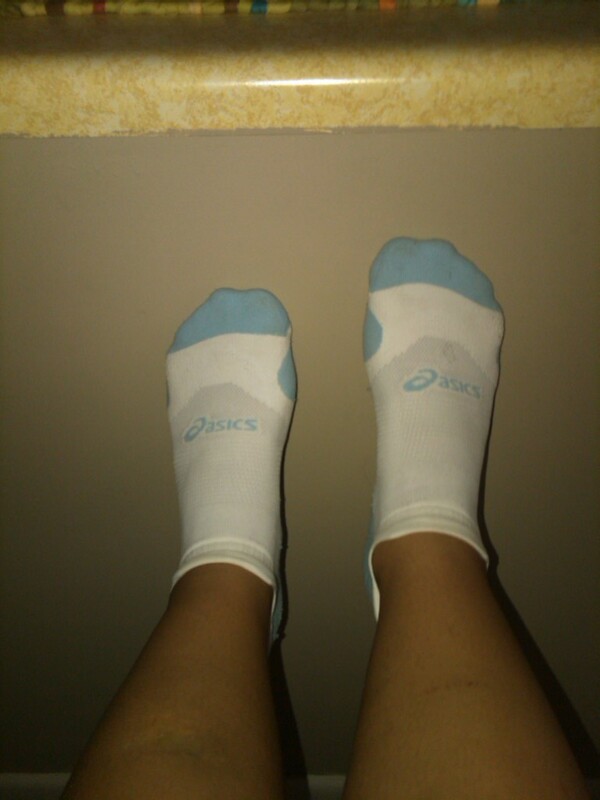 I am not a fan of socks, I actually didn't even own a pair of workout socks until about a year ago. I hated socks! I always wore my tennis shoes with nothing. Well when I started really running more than 15 minutes at a time I had to invest in socks so that I could keep from tearing my feet all to pieces. 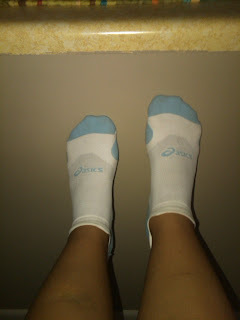 Then my shoes started tearing up and lots of people suggested that I should not wear cotton socks, and again we go to I went to the Sporting Goods store yesterday and got new socks. They are nice and tight on my feet without cutting off circulation, and all those nice little blue spots are actually extra cushioning. Its in all the right places, toes, under the ball of the foot, and around the heal, and they have this cute little flip on the back that keep them from falling down in my shoes. I really really like these puppies. I just wish now that I had bought more than a two pack so I don't have to wash them every day! Ok now that I have talked about all the new stuff that I bought I will talk about the run a little bit. This morning was a total of 7 miles, 2 of which were on the steps. We got started a little bit late because the fog made it impossible to see the steps, we did them but had to wait for a little more light. Actually, two of the girls did it before the sun came up...I still don't know how they saw the steps. Then off for a run. This one was over 3 miles so I ran in the 4:1 strategy. The running portion was much faster than normal and felt really good. I was able to keep the pace constant through most of the run. The last 4 minutes I slowed down a little bit as a kind of cool down. I think that 14 mile run last Friday really helped me break through with the running, the 14 mile run and the come to Jesus meeting I had to have with myself. I just hope I can keep these runs up at this new pace and continue to get faster and faster. But so happy to have another good run.